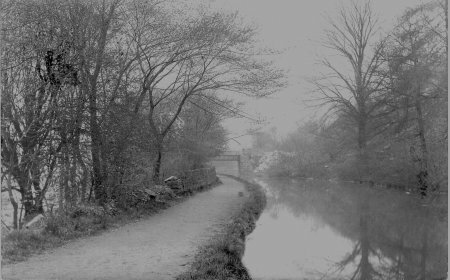 Cromford Canal, and in the distance is Sims Bridge (12), which used to carry the tramway from Duke's Quarries across the canal where stone was transferred to wagons on the main line railway which runs parallel to the canal, just to the left. 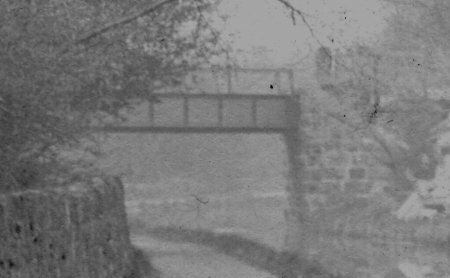 The original decking of the bridge was replaced about 1953 by a lighter weight footbridge. Some snow on the ground indicates the picture was taken in Winter. The postcard is franked 22 Dec 1904 from Matlock Bath and from Crich. The stamp is Edward VII but red (1d) not green (½d) and sent to Accrington, Lancashire. The message is a Christmas greeting, obviously the sender was eager that it reach its destination within 3 days!